4K is the new 1080p. Ultra HD explained. 4K is the next generation of high-definition video. And if you think HDTV is high-def enough? Wait until you see Ultra High-Def TV! 4k is now officially "Ultra HD". But to officially qualify as Ultra HD, a display needs to have a resolution of at least 3,840 pixels horizontally and at least 2,160 pixels vertically. 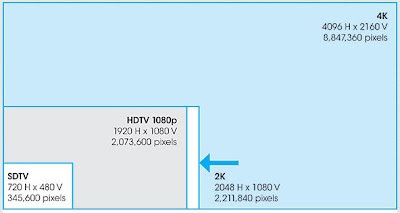 To put it simply, a 4K image has more than 4 times as many pixels as a standard 1080p HD image. However, resolution isn't everything. Many other screen technologies (contrast, brightness, etc.) and viewing distances must be considered. For most displays under 50-inches, our current 1080p displays in our current living room setups are near "retina display" quality. Retina Display is a term coined by Apple to define a resolution where the human eye cannot resolve individual pixels at a typical viewing distance. But for bigger displays (and bigger is always better), Ultra HD is like looking through a window on your wall. It's huge, and it's incredible. Unfortunately, as with all new things, it's an unattainable technology for most consumers. Right now, only three brands even offer 4K "Ultra High Definition" displays: Sony, LG, and Toshiba. And all three are extremely expensive. LG's "Ultra High Definition" TV is an 84-inch display that will cost you $20,000. Sony's is the same size. but even more expensive at $25,000. And Toshiba's "Quad Full HD" TVs currently come in two sizes -- 55-inch and 84-inch -- at similarly high prices. But even if you could afford these TVs, there's not much content out there in the 4K ultra high-def format. Of course you could always upscale Blu-rays or HDTV and it would look fine. Or you could shoot the footage yourself using a 4K-capable camera (i.e. the new GoPro Hero 3 Black Edition). But unless you can somehow get your hands on the 4K content produced mainly for commercial movie theaters, you're SOL. However, just like HD and 3D, this technology will become more affordable and the content more mainstream. But unlike 3D, this is no gimmick. 4K is the inevitable future of television and film. And before long, Ultra HD will be the norm. So I have just recently been introduced to "The Slow Mo Guys" on YouTube. 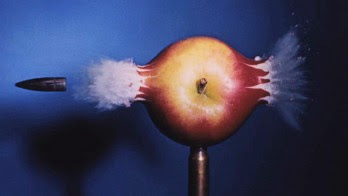 And now, of course, I want a high-speed, slow-motion camera. And so, of course, I started doing some research. You don't need a Phantom v1610 high-speed camera capable of 1,000,000fps to capture and create great slow-motion video. All you really need is a camera capable of 60fps to 120fps and after-effects software like Twixtor to "speed up, slow down or frame rate convert your image sequences with visually stunning results." Did I miss any? If so, let me know in the comments below. Update: Instead of spending thousands of dollars on one do-it-all camera like the Canon EOS 5D Mark 3, I decided to buy the Sony NEX 5-R and the new GoPro Hero3 Black Edition. Between the two they can do just about everything I want from a camera, including: portraits, action shots, landscapes, night sky, underwater, and, of course, slow-motion video.